Unique method in an advanced process for treating air. Salin®Plus uses a new and unique method in an advanced process for treating air. The structure of the device is compact and consists of a special filter made from microcrystalline sediment and a bellows mechanism. It is suitable for everybody including young children and pregnant mothers as it contains no corticoids or steroids. 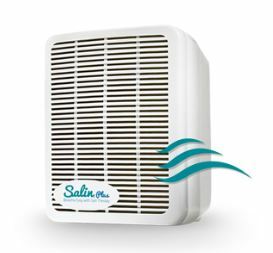 The Salin®Plus Air Purifying Therapy has proven to be a great benefit to sufferers of ear, nose and throat infections as well as allergy problems. Users have experienced significant reductions in symptoms of Rhinitis (Hay Fever), Sinusitis and Laryngitis. Salin®Plus is particularly effective in the reliefe of Asthma, Sinusitis, Rhinitis (Hay fever), Bronchitis, Cystic Fibrosis, Allergies, Chronic Obstructive Pulmonary Disease (COPD), Snoring and Sleep Apnoea. Parents of children with Down Syndrome have reported huge improvement of their breathing and sleep pattern since starting to use Salin®Plus. Video of Salin Plus - Salt Therapy for asthma, bronchitis, hay fever, sinusitis, snoring, and more.